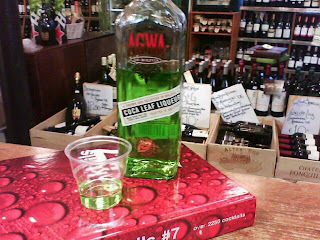 A Bolivian Coca leaf liqueur distilled in Amsterdam.... Sounds ominous. Every 700ml bottle contains 40grams of Coca leaf and is blended with Guarana & Ginseng. On the nose it smell exactly like Rose's Lime Cordial but it tastes absolutely nothing like the sweet& tangy lime concentrate. It's all herbs and soft vanilla but with a bit of an Oesophagus warming effect on the finish.... a must for any Spirit attempting to become a must-stock/ must-reside in my drinks cabinet. This is a liqueur for mixing - it's not undrinkable neat but it's quite neutral and works really well in male-octails. There is nothing soft and squidgy about this product or the recipes to follow. Whole lime cut in quarter with 1 tablespoon of sugar and muddle well. add chipped ice then 2 msrs of Agwa liqueur. Use bar spoon to mix the sugar and lime combo with the Agwa, the melted ice will dilute the Liqueur. Shake 1 msr of Agwa with a msr of Bacardi 8yr, add freshly squeezed Lime juice with cloudy apple juice, Shake over Ice well and Strain into High-ball glass.